Theme parks are fun for all of the family, whether you are an adrenaline junky after your next roller coaster fix, want to feel like a little kid again or want your own children to have the best time of their lives, then California has all of that to offer and more. SeaWorld San Diego theme park in California is a great family day out for thrill seekers, children and animal lovers: this park has it all in one! From adult rides and children’s entertainment to the all famous Shamu and dolphin shows SeaWorld of California is a day that will be enjoyed by everyone. The park is open from 10am-7:30pm and is easily accessible by public transport. The park also offer a stroller hiring service for getting your little ones around the park and even have wheelchair rental and a ride accessibility programme for guests wishing to use special access. For the thrill seekers of the family there is the Journey to Atlantis, a water ride that will take you back to lost civilization, ride the waves on the Shipwreck Rapids and embark on a thrilling helicopter journey on the Wild Arctic Ride. Sea World San Diego now also has the adrenaline pumping roller coaster ride Manta for the more adventurous. To keep the younger children entertained there is Elmo’s Flying Fish ride, Abby’s Sea Star Spin and Oscar’s Rocking Eel. 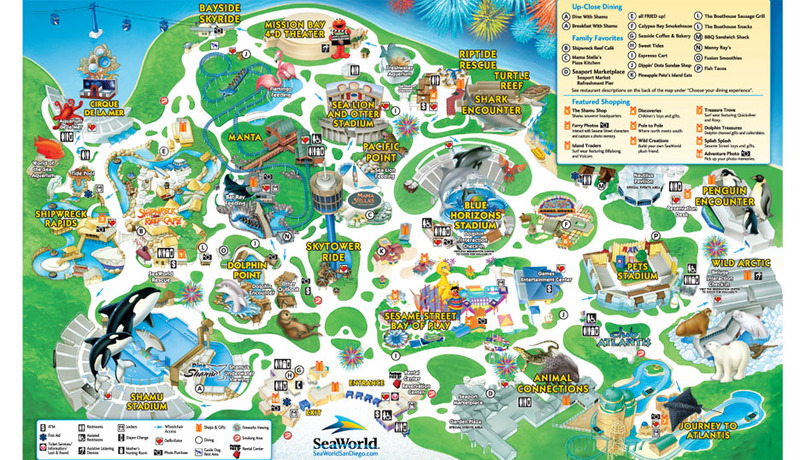 SeaWorld of California run a variety of shows that are fun for all of the family to enjoy together. Watch the dolphins do their thing in Blue Horizons, see the Sea Lions Live, watch the best dog tricks in Pets Rule and visit Elmo and friends in Sesame Street Presents: Lights, Camera, imagination. Also watch SeaWorld’s all famous killer whales perform in Shamu Rocks, learn about the history of Shamu in The Shamu Story and enjoy SeaWorld’s all new Shamu show, One Ocean! For animal lovers you can also get up close and personal with some of the SeaWorld residents. Touch a bottlenose at Dolphin Point, interact with dolphins and Beluga Wales in SeaWorld’s interaction programmes and encounter sharks as you journey through one of the world’s largest underwater tunnels. After all that excitement you can refuel with a bit of food and drink at many of the park’s dining hot spots or even have breakfast or dine with Shamu! For those who wish to browse the shops there are plenty of opportunities to buy a great gift as a reminder of the day. Upcoming events not to be missed include Halloween Spectacular from 29-30 September and weekends throughout October and SeaWorld’s Christmas Celebration from weekends in November and throughout December. To visit one of California’s best theme parks book online today and save money on SeaWorld of California with TransfersÂ tickets.